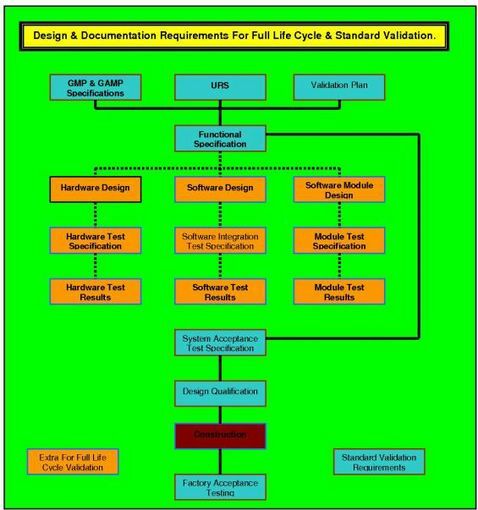 "Execution of the Operation Qualification protocol must produce sufficient data to verify that; all the operation functionalities mandated in the User Requirements Specification, have been fully complied with." This Operation Validation must be verified with the execution of a Operation Qualification (OQ) protocol. This is a really easy and straight forward document to use. In the preparation of the Operational Qualification validation protocols, it is important to allow a degree of flexibility. This must and should be specified in the Validation Plan (VP). Should the OQ remain untouchable until the Installation-Qualification (IQ) is completed and signed off? There are many instances where this is not just undesirable but senseless and deleterious to project progress and costs. Should every function in a system or piece of equipment be qualified? It makes little sense to fail something for not reaching a parameter that you are not going to use. The Operation Validation must include a review of the Standard Operating Procedure (SOP's) for start-up, operation, maintenance, safety, and cleaning / sanitization as applicable, must they be in fully approved format? These flexibilities must be built into the qualification process. However there is an abundance of rules and guidelines that are not flexible, and must be rigorously adhered to. The modular process has been followed in constructing this Qualification, in as much that where tests / inspections are standard for systems and or equipment, they are built into the basic protocol. Where they are not they are available as test protocols. Functional and software tests are authored in this stand alone test scrip protocol format. When the OQ is being raised they are pasted in. The document format will paginate them, and automatically add them to the ‘Table of Contents’. They are then part of the OQ. These Test Scripts can be held as Method Statements or SOP's. This allows the generation of a standard OQ that covers all the many items the regulators are looking for, with the facility to have integrated into it, the equipment specific testing tasks. It also means that these stand alone test scripts are available for tasks other than validation, i.e. when system re-testing is required. Rationalizing of Inspection and Test Occurrences. It also saves unnecessary testing and re-testing. For example, when a room pressure regime has been commissioned by another party and the completed report is in date and available, is it practical and legal to use it? There is no reason why not, providing it has been authored, and executed using the same documentation practices and procedures as are used in the routine production and execution of validation protocols. The OQ test scrip will be of standard format, the contractors tests (containing the raw data) will be reviewed and data extracted from it. This data will be used to verify that the Operation Validation test script acceptance criteria has or has not Operation Qualification Rationale.been satisfied. The raw data from the contractor now forms part of the OQ, and must be appended to it permanently, along with copy calibration certificates for all the test equipment used in obtaining the raw data. Where you use your own indigenous testing methods contained in an SOP or a Method Statement (or whatever you decide to call them), they must be used in a manner similar to the manner the contractors raw data was used. Insert a brief description of what part of the validated product process. Insert a brief description of the operation function. An integrated loop test verification. Testing of interlocks and permissive conditions. Testing of database or data storage integrity. Testing of report generation and event chronicle. Verification of the functionality of the equipment. Review of system functionality to verify compliance with 21 CFR Part 11. Testing to verify and document Power loss Recovery. Testing for Electromagnetic interference and compatibility. Why does something as simple as a spreadsheet figure in so many regulatory citations? Good question; and at times a difficult one to answer. When you ask a group of compliance personnel the same question you will be informed that Excel cannot be validated because it does not seal the original copy (of the spreadsheet), allows the original to be modified and has an audit trail that can be disabled. All true, but none of these problems interfere with your ability to validate that the spreadsheet is fit for purpose. They only preclude you from using the spread sheet as a compliant repository for any data that has to be store in compliance with 21 CFR Part 11. If the spreadsheet is signed off and dated by the user, their supervisor and QA, it becomes regulatory acceptable data stored in hard copy, and Part 11 does not apply. After numerous requests for this, we have launched our brand new SOP for Spreadsheet Creation to cover these and other known target points that the regulators consistently hone into as soon as they find that spreadsheets are being used. Use this Spreadsheet Creation SOP to ensure that you create spreadsheets that are validatable. Then use our spreadsheet validation pack to validate them.